…Up to May 6, WHO has confirmed that 25 countries are affected by the Swine flu and 31 persons have died from Swine flu. WHO data indicates that about 60 000 persons died from TB during the same period. 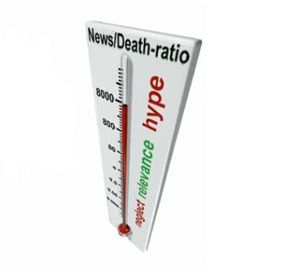 By a rough comparison with the number of news reports found by Google news search, Hans Rosling calculates a News/Death ratio and issue an alert for a media hype on Swine flu and a neglect of tuberculosis.